Hi there, and welcome to part 2 of the IBS Recovery 101 series. If you suffer from digestive problems, don’t miss the FREE meal plan that will get you feeling better inside of a week. It’s available in my free online support community: RecoveryFromIBS.com. If you don’t’ know me, I’m a Registered Dietitian trained in integrative and functional medicine. I have a private practice where I specialize in helping people recover from IBS. This post is about dysbiosis, which refers to the colony of bacteria in your digestive tract. This colony is known as the microbiome and is, in many ways, the control center for health. With dysbiosis, something goes wrong with the microbiome. It can either be an infection or just an imbalance of the normal gut flora. When it comes to infection, it can be either a parasite, a fungal infection, OR a bacterial infection. For example, a parasite infection would be giardia. Fungal infection is known as candida, and bacterial infections can be c. diff, e.coli, h.pylori, or shigella. On the other hand, dysbiosis could be caused by just an imbalance of the bacteria that normally live there. For example, IBS sufferers often have an overgrowth of a type of bacteria known as bacteriodetes. They also tend to have lower diversity, meaning fewer species overall in their microbiome. In either the case of infection or imbalance, the problem with dysbiosis is that it causes the symptoms associated with IBS: bloating, abdominal pain, gas, refux or GERD, and diarrhea or constipation. The specific symptoms will often depend on the type of dysbiosis. The labs that I use in my practice and recommend are Genova GI Effects, Doctor’s Data, Great Plains, and Diagnostic Solutions GI MAP. Different tests have different strengths, so I will choose based on the symptoms that exist. Step 1 - Remove: here, we want to remove any foods that are contributing to the problem as well as remove the infection or overgrowth. This is where you will see a diet intervention such as the low-FODMAP, Specific Carbohydrate or Candida diet. You’ll also likely see some form of anti-bacterial or anti-fungal herbal protocol. Alternately, this may be where an elemental diet or even prescription medication is used. If you fail to remove the ‘offending’ culprits, you will never get full resolution, so this is an important starting point that is often missed. Step 2 – Replace: this refers to replacing the digestive factors and nutrients needed for health and balance. You may see digestive enzymes, bile, or bitters here, betaine HCl, a pro-kinetic, and specific, targeted nutrients. Quality is really important here with regard to vitamins and minerals, essential fatty acids, and herbal remedies. This is another step that is often missed. Step 3 – Re-inoculate: this is where I see a lot of people trying to jump in. Specifically, we are aiming to provide the ‘healthy’ gut bacteria that are needed and people usually think of a probiotic for this. The type of probiotic that is best will depend on the type of dysbiosis found, ideally with testing. However, some forms have been found to me most beneficial for IBS in general and those are that have a combination of lacto and bifido species. Look for at least 10 strains total. I usually will aim to get people on a dose of 25 billion CFU twice per day of a good-quality product. Work up slowly to test your tolerance. This could be a talk of its own, but just be aware that two popular probiotics have recently been reformulated. Those are VSL #3 and PrescriptAssist. The brand that I most prefer is called Klaire Labs. In addition to probiotics, think about prebiotics here – these are special kinds of fermentable fibers that feed healthy gut bacteria. Both prebiotics and probioitcs are available from foods and supplements, so don’t omit one side of the coin here. One more note on probiotics – I specifically had a question about why a doctor would recommend a probiotic while treating an overgrowth. Healthy gut bacteria competitively compete against the pathogenic bacteria. They compete for nutrients, space, and even sometimes attack the ‘bad’ bacteria. So they can be helpful, even during the ‘remove’ phase However, this is controversial – some clinicians still wait until after the remove stage to recommend a probiotic. Step 4 – Repair: this is another often missing component of the process. We need to heal the gut using amino acids like L-glutamine and glycine from either supplements or bone broth. We also can use special forms of nutrients like zinc to aid healing. Soothing herbs such as marshmallow root, aloe, and deglycyrrhizinated licorice are also very helpful here. You don’t have to wait until the end to introduce these, but I at least wait until after any anti-microbial, anti-fungal, or anti-bacterial protocol is complete. As far as brands, I use quite a few. However, the bigger professional-grade brands will have pretty much everything you need – Integrative Therapeutics, Designs for Health, and Xymogen are good places to start. So, as you can see, there is more to this process than just taking a probiotic. An experienced clinician can help you get the right testing and treatment protocol in place, so that you don’t waste precious time and money on this process. 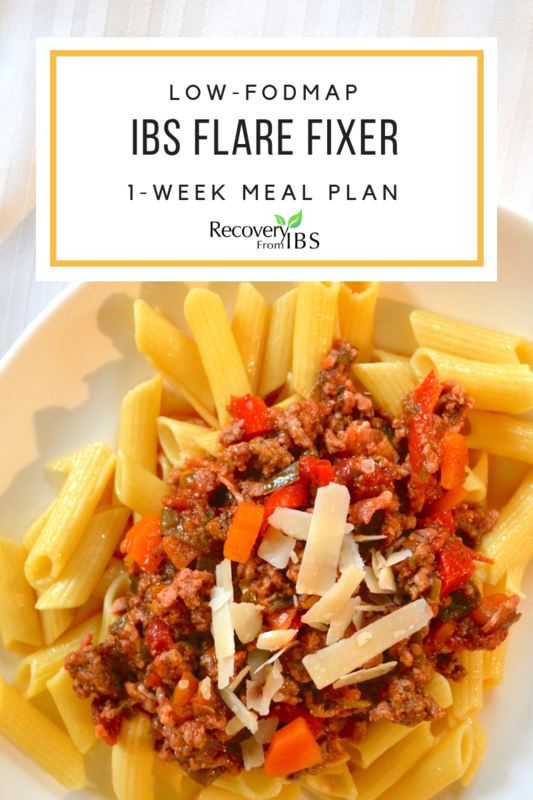 Don't miss my FREE one-week 'IBS Flare Fixer' meal plan! It's low-FODMAP, nutrient-dense, easy, and delicious! Gimmie The Free Low FODMAP Meal Plan! Note: Don't miss part 1 ( SIBO ) and part 3 of this series ( Leaky Gut ) !